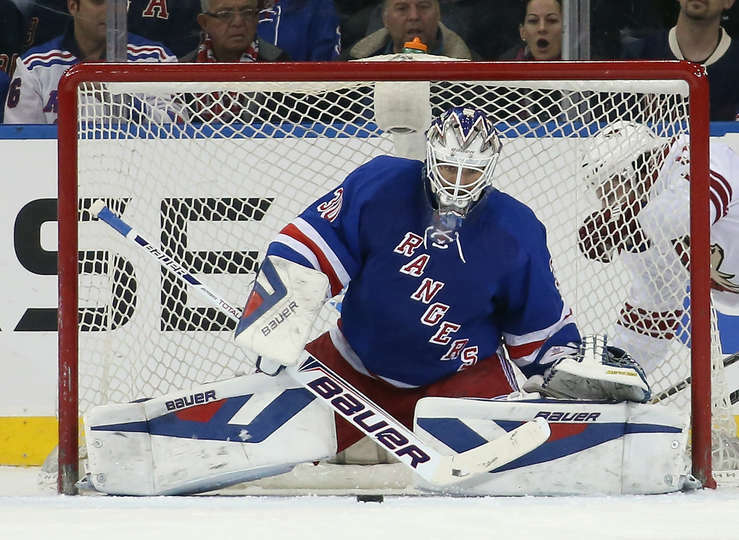 The Rangers pulled together in the third and eventually got the game winner in overtime to get 2 crucial points in the hunt for the playoffs, beating the Coyotes 4-3 on the day Henrik Lundqvist was honored as the winningest goalie in franchise history. The blue shirts got off to a tough start. The Coyotes seemed stronger, faster, and hungrier getting to loose pucks. This showed on the scoreboard as the Rangers sluggish start saw them give up two first period goals. The first came off of the stick of youngster Oliver Ekman-Larsson on the power play. The second goal was off of former Ranger Jeff Halpern. Halpern received an excellent pass from Kyle Chipchurra and buried one over Lundqvist’s glove. The Rangers were just being beaten in almost every way, especially I the face-off circle. The Rangers won just 24 of 63 face-offs. Things changed in the second period as the home team came out swinging. Just over 6 minutes into the period, Brad Richards tips in a shot by Carl Hagelin to get the boy sin blue on the boards. Five minutes later, Derick Brassard attempted a shot but was block by the Coyotes defenseman; Brassard then got the puck back and rifled a wrist shot past Mike Smith. Then late in the third, Chris Kreider tried to deflect a pass from Kyle Chipchurra and instead had it go through Lundqvist’s legs for Phoenix’s go ahead goal. The Coyotes were in a defensive mode and the Rangers kept attacking in the third. A scary moment in the third when Mike Smith was injured after Derick Brassard was pushed into him. Smith seemed to have injured his right leg and was replaced by back-up Thomas Greiss. It took over 16 and a half minutes until Dan Girardi tipped in a shot from Ryan McDonagh to tknot things up at 3. In the overtime period, Dan Girardi shot his off of Greiss’s pad and McDonagh was there to put the puck away into the wide open net and get the game winner. Did You Know? : Martin St. Louis and Derek Stepan didn’t play much in the third because of flu-like symptoms.